Hi folks. Have you got an older cat? If so, keep an eye out for the signs of hyperthyroidism. Hyperthyroidism is a subtle, yet serious threat to our older furry friends. It creeps up slowly, not necessarily obviously at first, but causing serious harm. The cause is an overactive thyroid gland in the throat, producing too much thyroid hormone. This causes heart disease, kidney damage, emaciation and death. 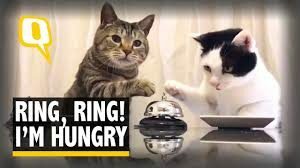 Hungry – Keep an eye out for signs of an increased appetite without gaining any weight, or indeed loosing weight. Thirsty – Also signs of drinking more than usual. 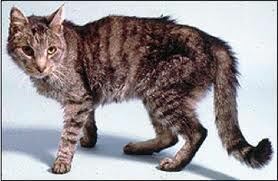 Scruffy – Often hyperthyroidism can make the fur unkempt and in slightly less good condition. We diagnose feline hyperthyroidism quite often, it’s not uncommon at all and is easily treated with a liquid medication which most cats take quite readily. There is a simple blood test which is run at Ashwood Vets and you get results the same day, it is often best to run the test in tandem with a liver and kidney check (which is something we recommend annually in all cats over 7 years old anyway). Together with a clinical examination, these tests usually cost around £125. Full vet exam & BOTH tests for any cat over 7. Hope this is helpful, warm regards, Patrick.